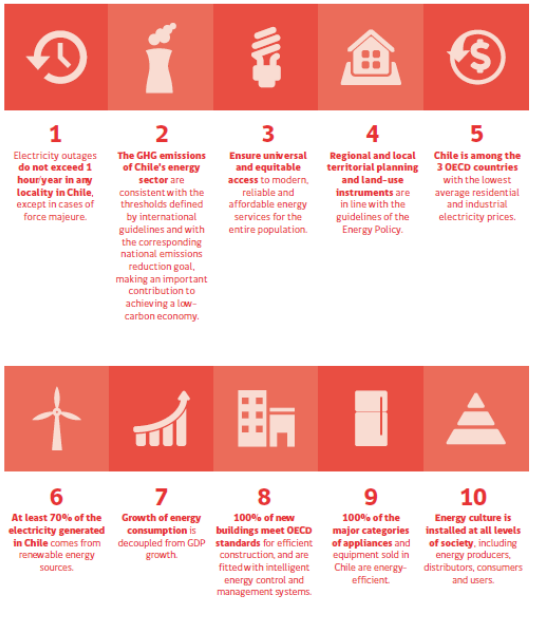 For Chile and its path to development, energy is a key strategic factor for reaching the economic and social development goals. When energy is obtained and used optimally, a virtuous circle is generated, and directly impacts economic growth, offers opportunities to care for the environment, and favors people’s well-being, thus allowing society to move towards equitable and sustainable development. A discussion process was carried out including key stakeholders from the public sector, industry, academia, civil society, people from a number of regions of the country, and a variety of representative citizens. The goal was to develop the country’s long-term Energy Policy. An Advisory Committee led by the Minister of Energy and composed of key participants from the sector was convened with regional and national representation. The members form part of various ministries and public institutions, trade associations, civil society, and Chilean universities. The Energy Policy proposes a vision of Chile’s energy sector by the year 2050 as being reliable, inclusive, competitive and sustainable. This vision is part of a systemic approach in which the main goal is to achieve and maintain the reliability of the entire energy system while meeting sustainability and inclusion criteria and contributing to the competitiveness of the nation’s economy. These attributes will allow us to move forward towards sustainable energy in all of its dimensions. In order to make this vision a reality by 2050, the Energy Policy is sustained by four pillars: Security and Quality Supply, Energy as a Driver for Development, Environmentally-friendly Energy, and Energy Efficiency and Energy Education. The proposed measures and action plans shall be developed on the basis of these pillars between 2016 and the year 2050. The Chilean target for doubling governmental investment in clean energy innovation as part of Mission Innovation is USD 9 MM by the year 2020. However, we expect that this target will be surpassed. 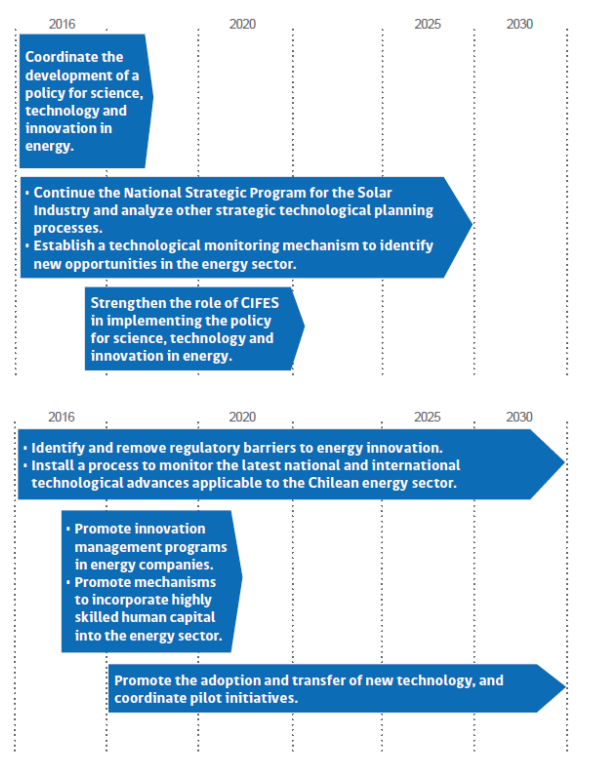 Recently Chile has developed a short-medium term energy roadmap based on the long term policy, where are included a prioritization of initiatives for the period 2018-2022. This roadmap is focused on leading the modernization of the energy sector based mainly on covering the citizen needs. For that purpose, it is organized in seven pillars: energy modernization, energy with a social stamp, energy development, energy with low emissions, efficient transportation, energy efficiency and energy education and training. Moreover, it has been defined ten goals to fulfill in the period, where the innovation must play an important role. Some of the goals take account of the increasing in four times the installed capacity of decentralized renewable energy, the increasing in ten times the electric vehicle by the 2022 and the de-carbonization of the energy matrix. 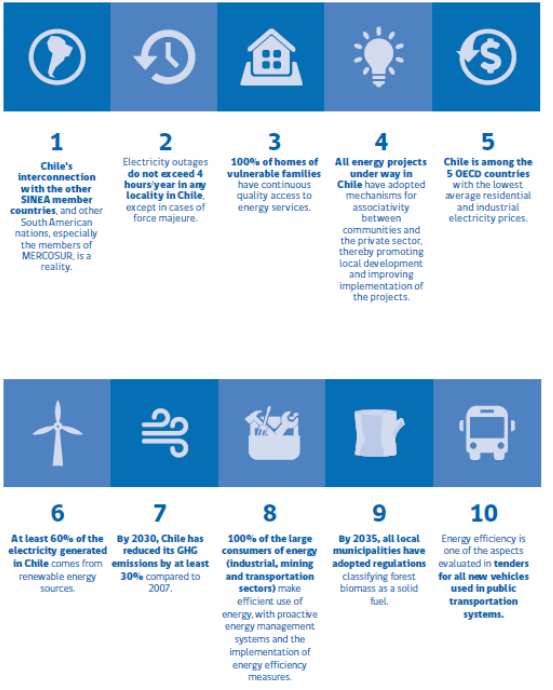 For Chile, energy is a driving force for the country’s development, but not just any type of development: Chile’s development must be respectful of people, of the environment and of productivity, and must ensure continuous improvement of living conditions. So according to this statement, and considering that there is no official definition of this concept, clean energy will be understood as all kinds of energy based on low emissions levels that contribute to reaching this multidimensional development.